The Tennessee Valley Authority operates the Colbert Steam Plant in Tuscumbia, Alabama. It is a coal-fired power plant that is scheduled for closure in 2016. As part of the plant shutdown, the Ash Pond 4 at the site requires structural improvement and closure. Geo-Solutions entered into a Joint Venture (JV) agreement Thalle Construction Company of Hillsborough, North Carolina to complete the work. 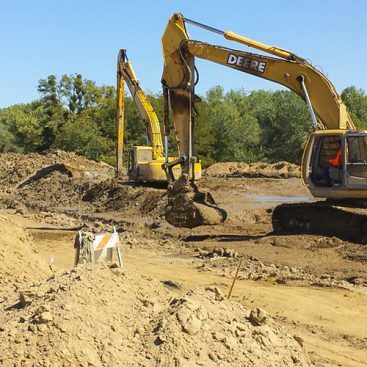 Geo-Solutions’ primary responsibility was the installation of the DSM, and Thalle was responsible for earthwork, site preparation, and other associated elements of the work. 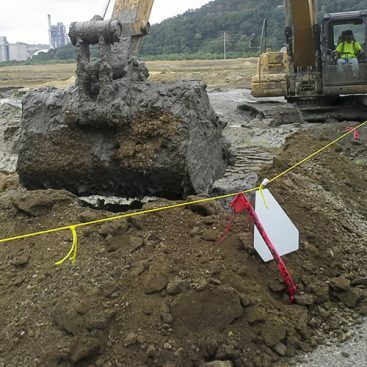 The purpose of the Soil Stabilization work was to improve the stability of the coal ash pond. The objective was to prevent failure of the ash impoundment during a seismic event. The ash impoundment is adjacent to Cane Creek and failure of the dike would cause a release of coal ash into the creek. The Engineer designed the project using in-situ mixing due to concerns about stability of the dike if an open-trenching method were to be used, and the close proximity of the waterway. The system of soil stabilization included the installation of 150 individual shear walls using Deep Soil Mixing. The shear walls were typically 30-35 feet deep and a maximum of 50 deep. Each wall consisted of 4 to 5 overlapping elements. Each element was created by a single stroke of the 4-auger DSM rig. The walls were arranged in “Y” pattern with 3 strokes in the “stem” of the Y and one stroke in each of the “wings.” The strokes of the 4-auger elements were overlapped by one full column on each stroke to ensure continuity. The DSM cutoff wall soil mixing was performed using Geo-Solutions’ 4-auger Deep Soil Mixing rig. This rig was mounted on a Manitowoc 4100W Series II crawler crane. The rig was fitted with 4 overlapping, 4-ft diameter augers designed to install a continuous wall with a minimum width of three feet. The hollow stem augers are rotated and advanced through though the soil as grout is pumped through them. In this manner, the soil is mechanically cut and blended, to ensure a homogenous mix throughout the DSM. The cement grout was created at Geo-Solutions’ on-site batch plant. Water was blended with Portland cement in a high-speed colloidal mixer using a bulk silo. The grout was then transferred to a holding tank within the plant until it was pumped to the DSM rig. The soil mix walls were drilled to make contact with the underlying Tuscumbia limestone. 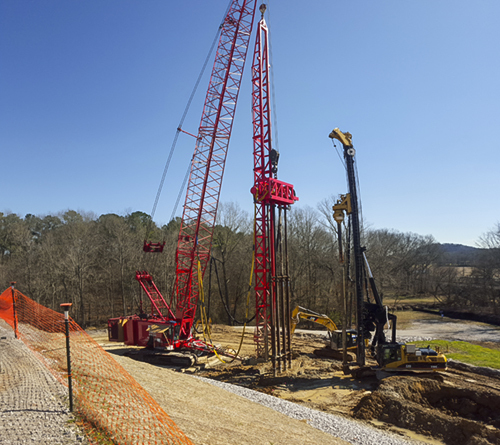 Due to the nature of the staggered augers on the DSM rig, and hardness of the bedrock (8,000+ psi), all of the augers of the 4-auger rig did not make contact with the limestone when completing an individual stroke. 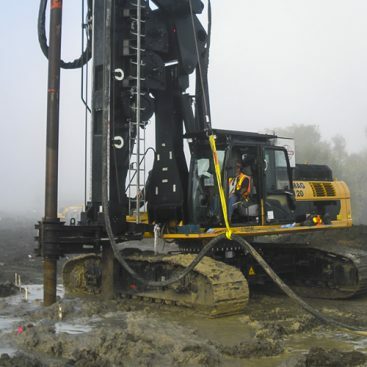 Geo-Solutions used an additional single auger rig soil-mixing rig to re-drill any individual DSM columns that did not make contact with the limestone. These single-auger plunges were done immediately after the 4-auger stroke while the soil-mix is still fresh. Using this technique, all columns in all walls made contact with limestone, which was a key component of the engineering design. The shear walls were laid out at the toe of, and perpendicular to the alignment of the ash impoundment dike. The spacing of the walls varied from 12 to 35 feet, and the length of the walls varied from 30 to 40 feet. The length and spacing were determined in the design by dividing the project into design segments. These segments were based on the surrounding stability of the area and the proximity to the creek. The limited space between the toe of the dike and the creek allowed for a narrow, 50 foot wide working platform. The blending of cement into the soils was designed to increase the shear strength of the soil. Prior to the start of the project, a laboratory mix design program was conducted to determine the reagent addition rates to achieve the project goals of 275 psi UCS. Numerous soil types were modeled in the laboratory to characterize different areas of the site. The installed shear walls include 15-20% Portland cement by weight of soil. Geo-Solutions submitted a Value Engineering proposal to our client to adjust the geometry of the shear walls. The original design had straight walls with a double-wide row of columns at the outboard side of the platform. Geo-Solutions proposed the “Y” configuration of the walls. The change in wall layout let to improved shear resistance. This resulted in a change of spacing and shortening of some walls in the final engineering design, which decreased total DSM quantity by approximately 40%. The main projects challenges include a narrow work platform due to the limited space between the ash pond and the creek. 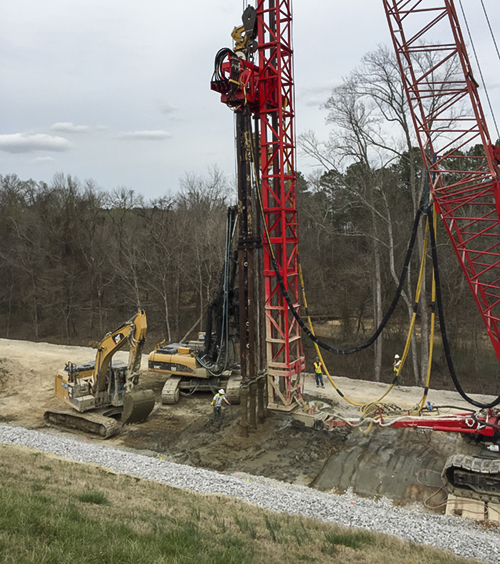 Geo-Solutions had to work with a large crawler crane, a single auger mixing rig and other earthwork support equipment working in a small area. The proximity to the creek also meant that there was a strict enforcement of preventative measures to eliminate any potential environmental release events.